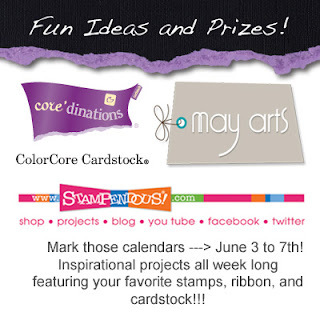 Stampendous, May Arts, Core'dinations and David Tutera - big Play Date! I know, I can't quite believe it myself! But yes, we're having another week of big and exciting crafty collaborations! This week Stampendous gals are teamming up with the lovely folks at May Arts Ribbons and Core'dinations. 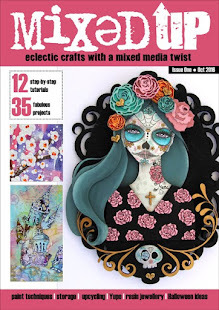 We also get to play with the new David Tutera line of crafty products from Core'dinations. Every day during this week the design teams will be bringing you new projects and creative ways to use products from this Great Trio of companies. And before you ask, yes - we again have LOTS of prizes for the participating hoppers, so be sure to hop along, visit and comment on as many blogs as possible to increase your chances to win some amazing crafty stuff. Here's the first project I have to share with you and I will be back again on Friday for the big Collaboration Finale. I've made a summery birthday card using a card blank and a die cut decorative panel and border from the David Tutera collection. The background paper was from my stash. 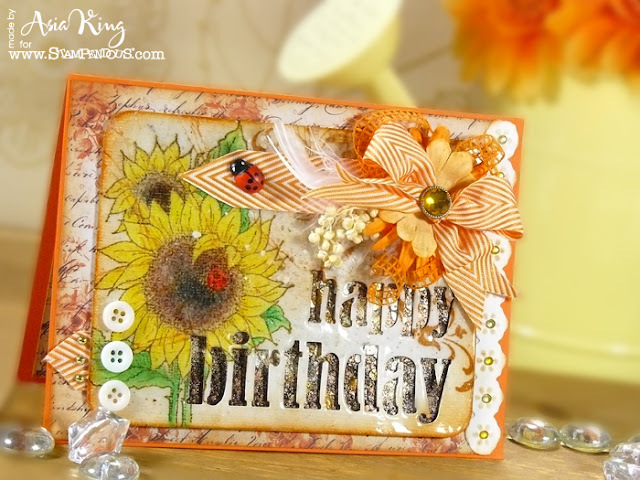 To create my main panel I first stamped the lovely cling Sunflower Ladybug stamp with Coffee Archival directly onto the die cut Core'dinations card. 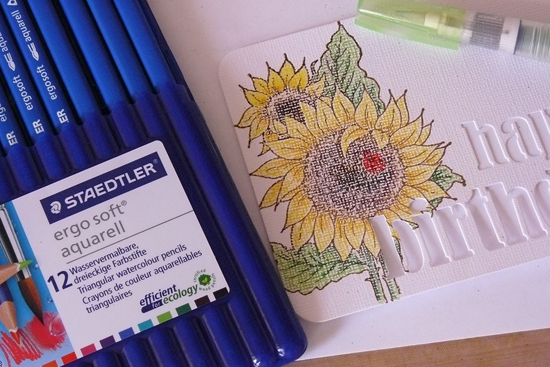 Then I coloured my image with STAEDTLER Ergo Soft Aquarell pencils. I blended the colours with my water brush. Next I stamped a swirl in the opposite corner, the swirl is from the Peruvian Lily set. I also added some distressing around the edge of the panel with a Rusty Hinge DI. In the next step, I heat embossed the whole panel with 5 layers of Deed Impression Chunky Clear embossing enamel. I sprinkled some Shabby White embossing enamel between the layers - the white dots look as if they are floating :). 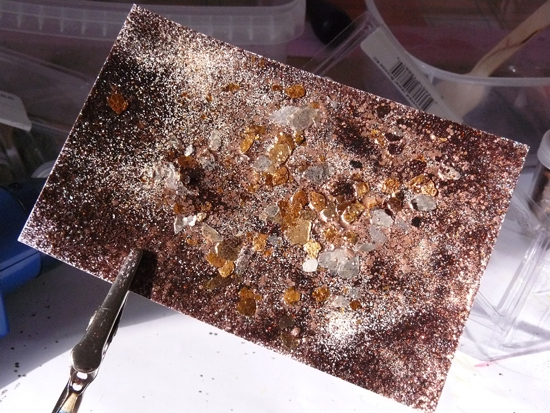 Once the melted powders cooled off I cracked the enamelled layer in a few places for a cracked glass effect. To highlight the cracks I swiped more of the Rusty Hinge ink. For my flower arrangement I used some paper flowers from my stash and gorgeous ribbons from May Arts. Check out this fab orange Twill/Chevron Stripes ribbon! And that sweet little ladybug was in the blog candy package I recently won from from the lovely Laura (thank you honey!). My main sentiment panel was layered over a piece of card that I decorated using encrusted jewel technique. For my encrusted jewel technique I used: Golden Sand embossing powder, Mica fragments from the Fran-tage Mica kit, Aged Gold Embossing Enamel, Aged Copper Embossing Enamel and Vintage Mahogany Embossing Tinsel. Awww... I am sooo loving the sparkle! OK, that's all from me for now. Now it's time for you to see the rest of the amazing projects and get totally inspired! 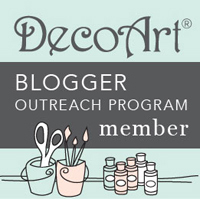 Leave a comment on each blog for the best chance at winning. 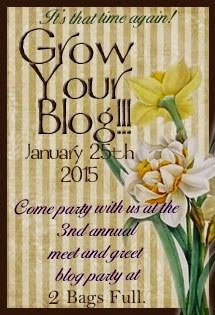 PLUS... visit our facebook page and SHARE on your Timeline one of this week's posts about this Blog Hop. We'll choose 4 random winners this week from the "sharers" - 2 will get to choose ANY roll of May Arts ribbon and two will get tag packs from Core'dinations. (this is beyond the regular prizes already mentioned! ).So visit our facebook PAGE - click the word Share underneath one of our posts, and choose "Share on your Timeline" to enter. Thanks for popping in and for all your heart warming comments! This is beautiful Joanna. I love all the techniques used and I love the little ladybirds!! 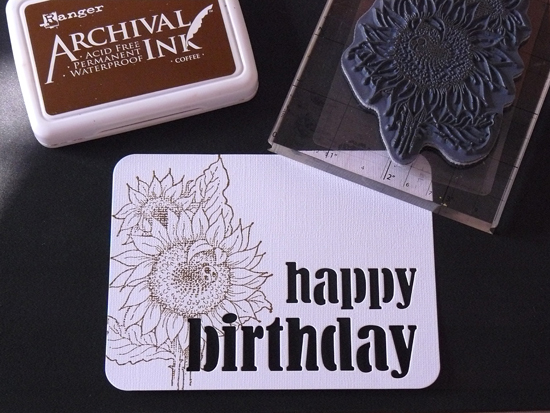 This is fabulous - what a wonderful idea to stamp on the DT overlay - will have to try this! SPECTACULAR! 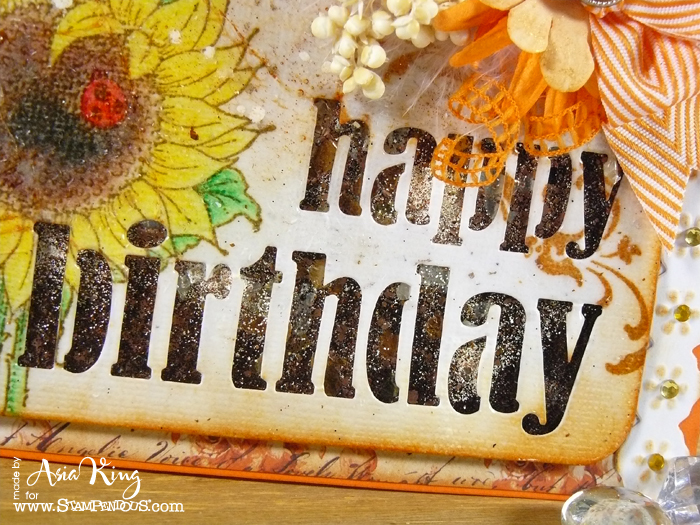 I love how you did the Happy Birthday as a negative cut and the colors! OH, the colors are stunning! The little ladybug on the ribbon flower is delightful and all of the mica, embossing powders and encrusted jewels are just incredible! The overall effect is just STAMPENDOUSLY SPECTACULAR! Thank you for sharing this gorgeous creation with me! The other designer's have a high bar to meet to reach this lovely creation today! This is so wonderful. I love all the details from the water colored flowers to the clear embossing of the whole panel. It really makes it standout and the ribbons and the lady bug just are the perfect touches. Such an intricate and lovely card. 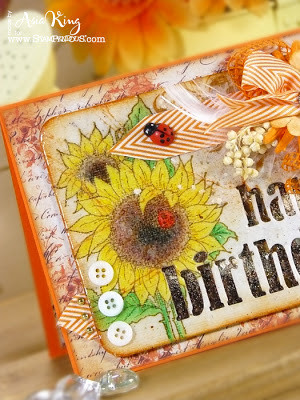 I love how the texture of the card stock shows through on the water colored flowers. OMG.. This is beyond gorgeous.. Love everything about this card.. Excellent piece of art work.. This is SOOOO me!! I love the earth tones, and the natural look. Nice job. Wow! This is an amazing project, love all the detail. Love your beautiful card and the Chevron ribbon is just delightful! Love the card. It is so summer with the sunflowers and the colors. Wonderful Joanna, so bright and summery and full of great techniques. Very pretty--I like the colors and special embellishments. Wow your creativity amazes me, the textures, colors and overall design are fabulous, love the added details with the ribbons and flowers!! This is terrific, Asia! Your Encrusted Jewel Technique Tutorial is spectacular. LOVE the way you let it show through the diecut words. Just wonderful. Thanks so much for playing with our blog hop this week! Does it get any prettier? I don't think so! Lovely card, Asia! Your colors are so pretty. I like how you put it all together so nicely. It's really special. Such a beautiful card. Lots of interesting techniques used on it. I love the cracked enamal treatment and the ribbons are to die for. Thanks for sharing your lovely card. This is magical - I feel so lucky to have found you!!!! That is so gorgeous. What a wonderful card design. 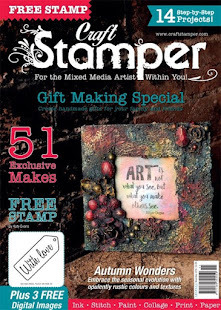 I also posted about Stampendous on my Timeline too. Sooooooooo much to love in your card!!! Thanks for the tutorial. I'm a beginner, so it really helps me. WOW!!! Amazing creation as always!!! This is "Frantastic." What a wow factor using the fragments have! Love this summery card and the coloring is so soft and lovely! Hugs! Loving it! Such a wonderful creation, thank you so much for sharing!! I love this card, orange is my favorite color! Thanks for sharing. Asia, your card is amazing...so glad you detailed the process so we could get the full effect, love the way you layered the stenciled title over the embossed fragments. 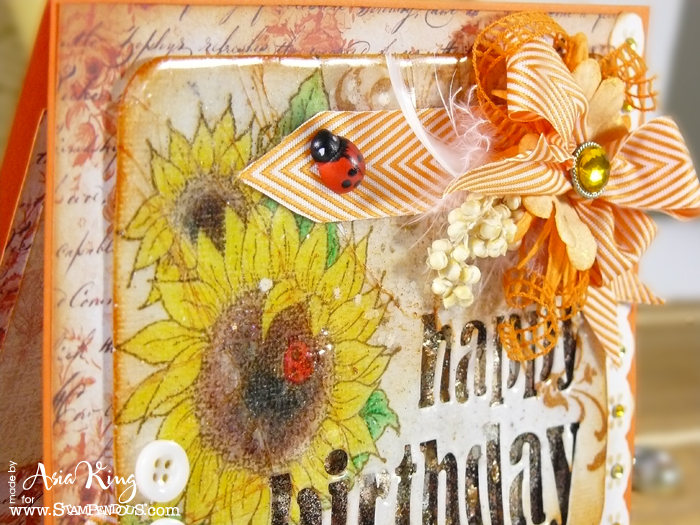 LOVE the way you layered all the ribbons and flower to make your embellishment for this card. Fabulous! Love the stencil over the jewel encrusted panel. Awesome. The sunny colors are fabulous! WOW - stunning card Asia!!! LOVE ALL the techniques & delightful elements you have combined together!!! Fabulous work again ... so much detail! What a brilliant card! I love all of the detail on it and the texture. This is one of my all-time fave's of yours. :) TFS! Gorgeous! Love the clear embossing powder with the cracked look..
What an amazing Wow card! Love the cool decorative die cut panel! I'm sooo loving that sparkle too! Gorgeous background. Sunflowers brighten my day. I hope they brighten everyone else's!!! Wow... Your card is stunning. Every detail is amazing. Girl , this is a mini " Master Piece " ! Just stunning ! Thanks so much for the instructions , I'm going to try this . Wow !! As a fall birthday baby I am going to make this beauty for myself, makes me want to curl up in front of the fire and sip some cider. Love it! So many details and they all work together so well! Oh this looks like a load of fun to make. Love all the textures and the end result is fantastic. Love it. Thanks for joining us at Live and Love Crafts. some great use of die cuts and a gorgeous sunny make !